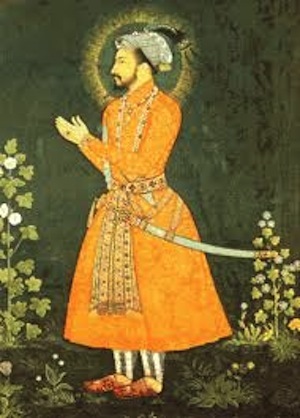 Shah Jahan was Born Prince Khurram in 1592, but changed his name when he turned 35 and took the throne. The name means “king of the world” and he ruled India from 1628 - 1658 with the support of many experienced administrators and advisors, who had previously guided his father-in-law Asaf Khan during his rule. As a child, he was chosen as his father Emperor Jahangir's successor. When his father died in 1627, Jahan ascended to the throne. Prior to his father's death, at age 14, he fell in love with the Persian Princess Arjumand Banu Begum and declared he would marry her, which he later would in 1612. When he took power in 1628, he ultimately had her name changed to Mumtaz Mahal, which means jewel of the palace. Shah Jahan is considered by many to be one India’s greatest medieval Muslim rulers because he was a brave commander and a generous master who treated his servants and people with respect and dignity. He is also famous because he constructed the Taj Mahal. During his rule, he pushed against the independent Muslim Sultanate of the Deccan Plateau region of southern India, but was mostly unsuccessful at gaining ground in southern India. For the most part, his true rule and residence primarily covered central and northern India. In early years of his reign, he preferred living in the city of Agra, but he eventually moved his empire to Delhi. He loved beautiful architecture and had a lot constructed while in power. 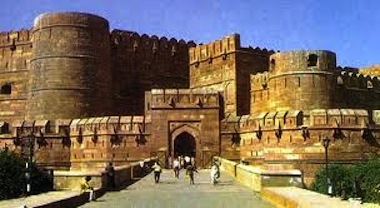 He renovated Agra Fort and made several new additions to the fort including a court for the public to gather, a garden, and rooms for his and his servants’ use. He also built a congregational mosque in 1648 called the Moti, which means Pearl Mosque. Its name comes from the translucent white marble used to create its interior. In 1638, Jahan moved his empire from Agra to Delhi. From the later portion of his rule to the end of the Mughal line, the famous Red Fort was heart of the Muslim empire and the principal residence of its emperors. Though he had other wives, Mumtaz Mahal was always his favorite and they were never apart; he even took her with him on military activities. Sadly, in 1631, Mumtaz Mahal died due to complications during the birth of one of their children. After her death, Jahan was so heart-broken that he had a monument built for her. 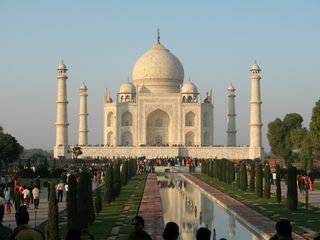 Construction of this monument took 22 years and thousands of people; the monument is, of course, India’s Taj Mahal. The death of Mumtaz Mahal was not the only sadness that Jahan faced in his later years. He had four sons, who grew up in a setting of rivalry. Dara Shukoh, Shah Shuja, Aurangzeb, and Murad Bakhsh were all his children birthed by Mumtaz Mahal. In 1657, Jahan became very ill and the children began to assume he would die early; competitions with one another for his throne ensued. Dara Shukoh, was Jahan’s oldest son and, therefore, his heir, but Aurangzeb was a political realist who enjoyed power and military authority. It was Aurangzeb who officially and forcefully took the throne in the summer of 1659. Shah Jahan ruled for 30 years, but his last days were tragic. Shah Jahan was sick and watched hostility breakout among his sons. Aurangzeb actually imprisoned him in the Agra fort for eight years, where his daughter Jahanara watched over him. From Agra Fort, Shah Jahan had a clear view of the Taj Mahal and legend has it that his eyes were fixed on the Taj when he died in the fort. After his death, Shah Jahan was buried in the Taj Mahal beside his dead queen, Mumtaz Mahal. Leave Shah Jahan to discover the ten most influential India people. Learn about traveling to India. Explore much more about India from our homepage.